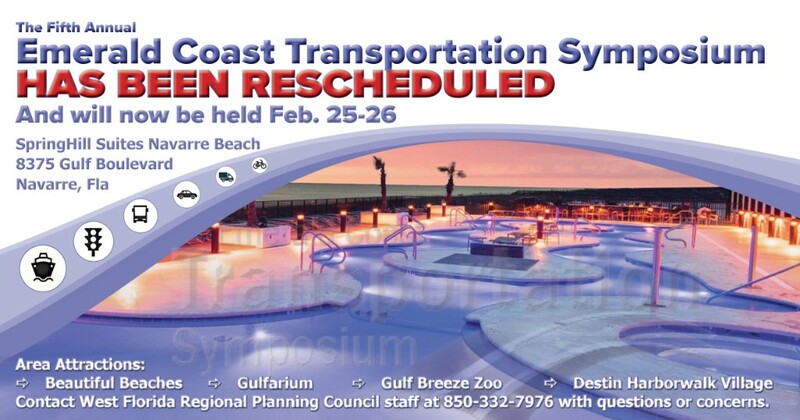 In the aftermath of Hurricane Michael, and in the best interest of those hurting across our region, we, the West Florida Regional Planning Council, found it necessary to reschedule the Fifth Annual Emerald Coast Transportation Symposium. The symposium will now be held Feb. 25 – 26, in the original location – the SpringHill Suites in Navarre, Fla. We apologize for any inconvenience, confident that our friends and partners will agree that the region needs time to unite, strategize, and heal. 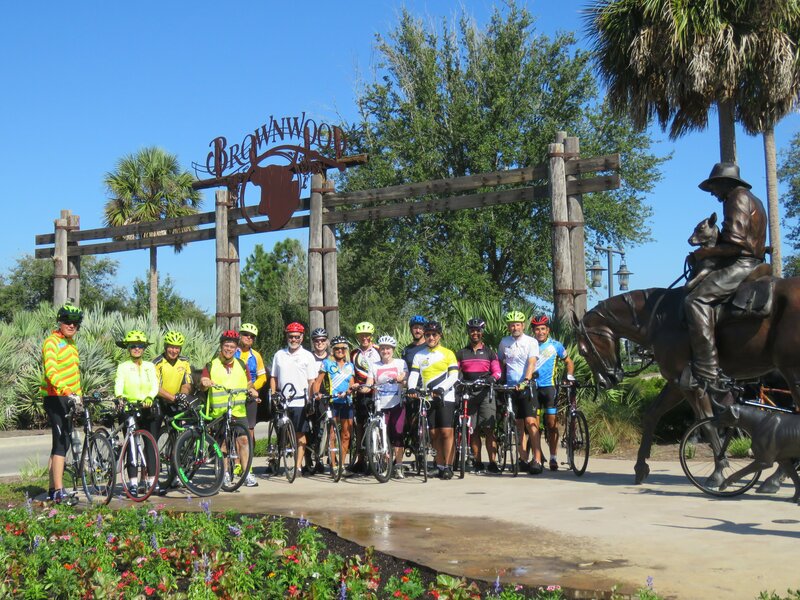 We will continue our mission to preserve and enhance the quality of life in northwest Florida with increased passion that is fueled by our love for this region and the spirit of camaraderie and compassion we are witnessing as the efforts to move forward begin in the easternmost part of our region. Thank you for your understanding and be assured that we eagerly look forward to Feb. 25 – 26. 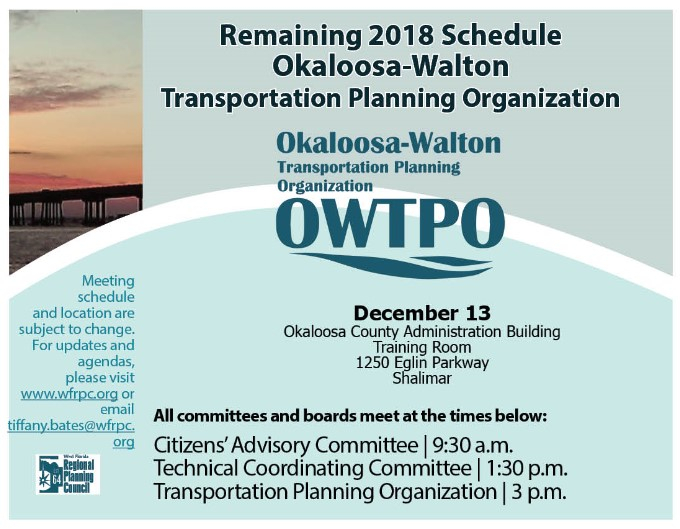 We promise to deliver a symposium that, as always, will inspire our transportation professionals, but will also aid in the future planning and restoration that is now so desperately needed. Current registrations will automatically be applied to the February dates unless a refund is requested. Registration will remain open for those who wish to attend in February. All hotel reservations, made with the SpringHill Suites in Navarre, Fla. for the November dates have been cancelled. The original room rates apply, but rooms must be booked under the new dates if you wish to stay onsite. 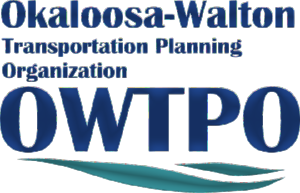 Please book online or call 850-939-0010 and make the reservation under the block Emerald Coast Transportation Symposium. Please contact Brittany Ellers with questions regarding registration. Above: The assessment of transit stops revealed moderate to extensive damage at most locations along many of the eight routes. 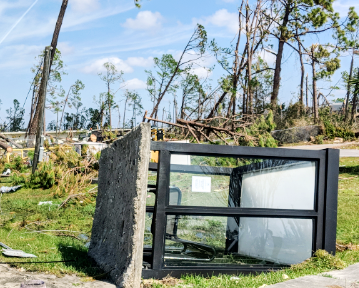 Hurricane Michael was the most devastating storm to hit Florida’s Panhandle, leaving previously unknown destruction in a large portion of the West Florida Regional Planning Council’s region. WFRPC has been active in the hurricane recovery efforts, finding many ways to help those who are hurting. 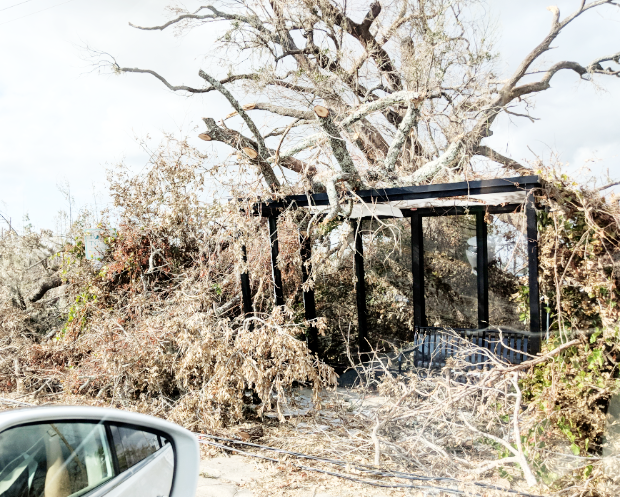 WFRPC’s State Housing Initiative Program’s (SHIP) staff initiated the enacting of revisions in Holmes and Washington Counties’ disaster strategies within their respective Local Housing Assistance Plans (LHAP) to assist communities affected by the storm. 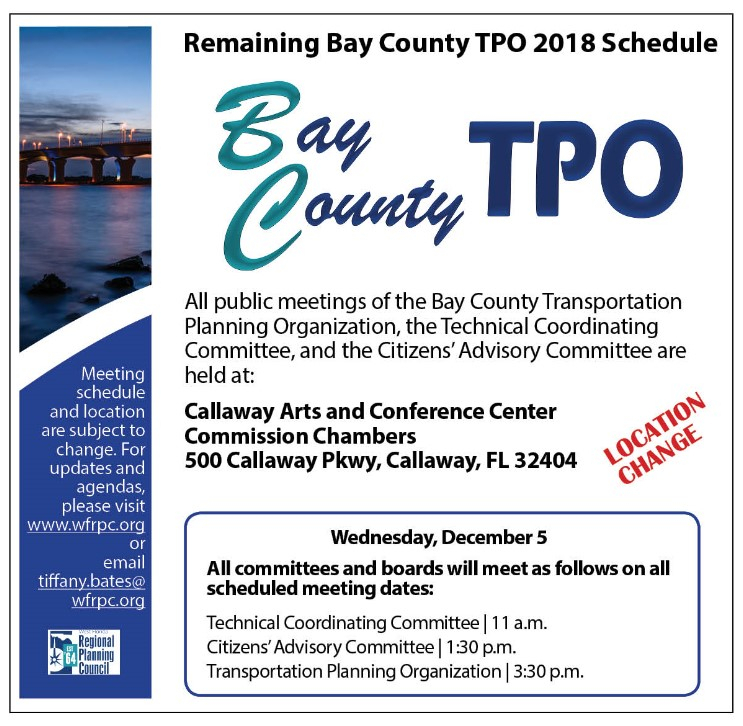 WFRPC also provided relief staffing support at the Bay County Emergency Operations Center, and members of the transportation, GIS, economic development, and public involvement staff conducted an initial assessment of the Bay Town Trolley transit routes to provide an interactive status report to the trolley staff, enabling them to determine a feasible plan for route reinstatement in the early stages of the recovery process. 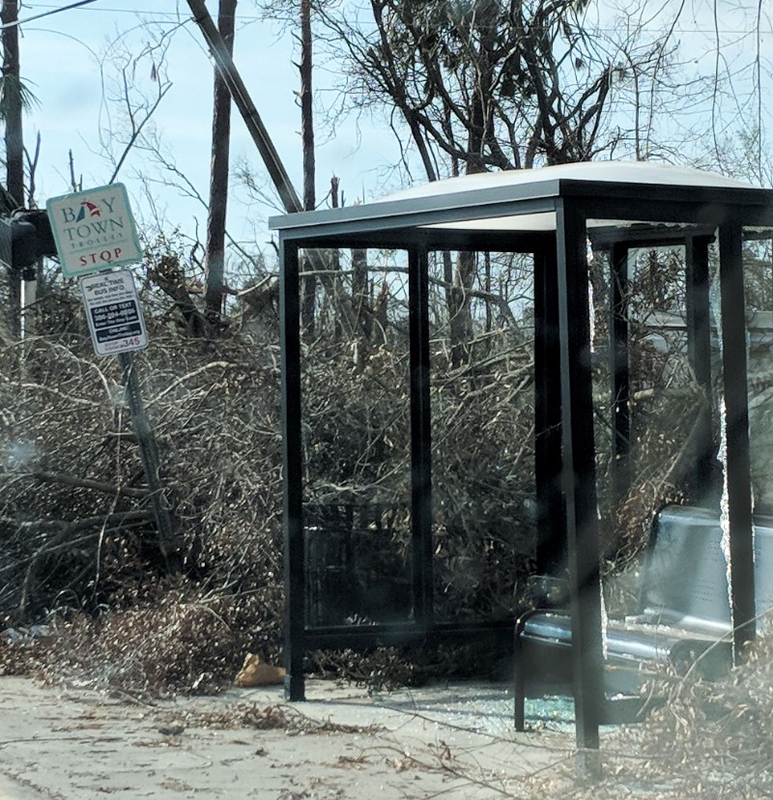 Staff continues to reach out and respond to requests for assistance as the eastern part of the WFRPC region struggles to rebuild, restore, and return to normalcy. As always, WFRPC pledges to move forward with concern and compassion for all those affected by this tragedy as we uphold our mission to preserve and enhance the quality of life in northwest Florida. 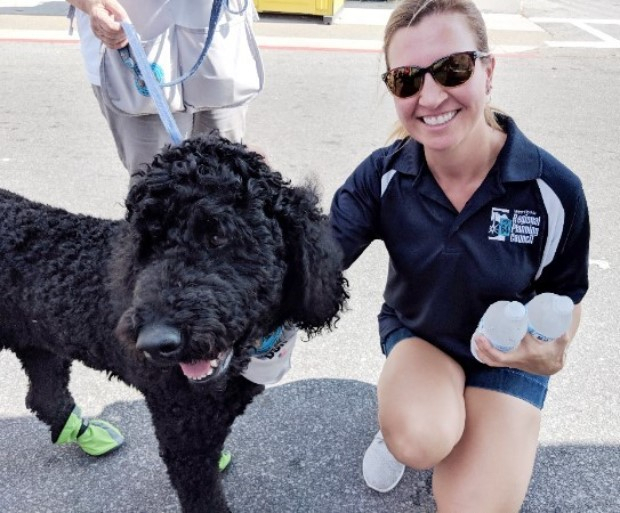 Right: During a long day of transit route assessment, West Florida Regional Planning Council GIS Coordinator, Jessica Paul, enjoyed a moment with a stress relief therapy dog, brought to a Panama City distribution site by one of the countless volunteers who traveled to the area to help in any way possible. Pensacola City Councilwoman, Sherri Myers, hosted the 9th Avenue Town Hall Meeting on Oct. 24 at the Asbury Place in Cokesbury Church. The Councilwoman opened the Town Hall meeting with a brief presentation outlining the vitality along the 9th Avenue corridor and some of the challenges faced by the roadway users. More than 50 attendees, including elected officials, residents, and students, were in attendance. Councilwoman Myers opened the floor to hear attendees' concerns. 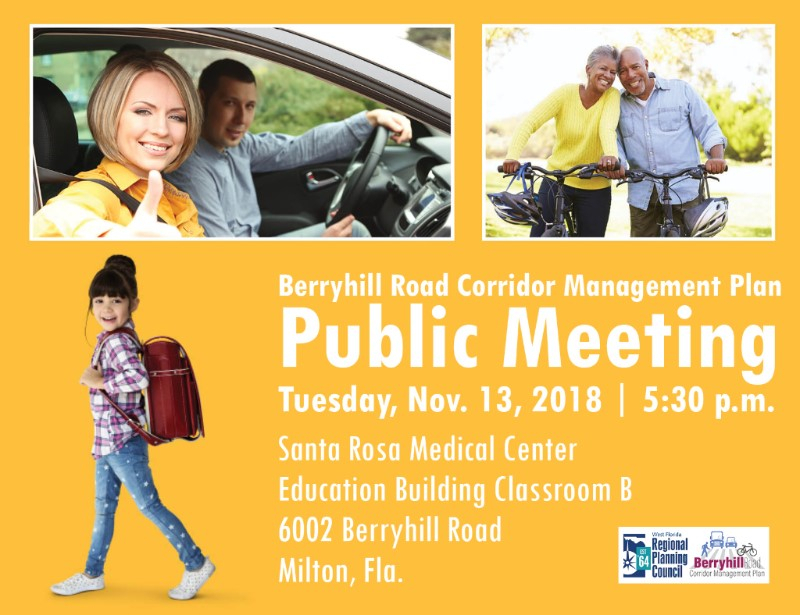 Many citizens expressed a lack of safe pedestrian and bicycle facilities as well as flooding issues along the corridor. 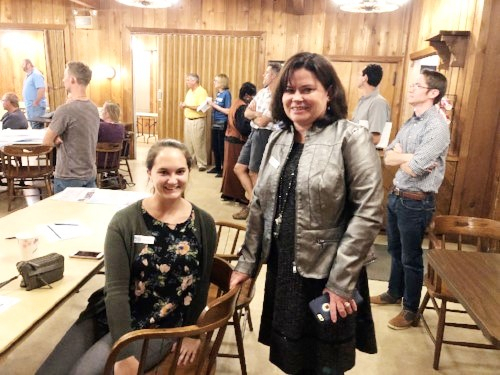 West Florida Regional Planning Council staff members, Mary Beth Washnock, Kristen Barre, and Brittany Ellers (not pictured) were in attendance, gaining insight on the community concerns along the 9th Avenue corridor to aid in future transportation planning for the area. Staff was also available to explain the transportation planning process and how it relates to the concerns of the roadway users. 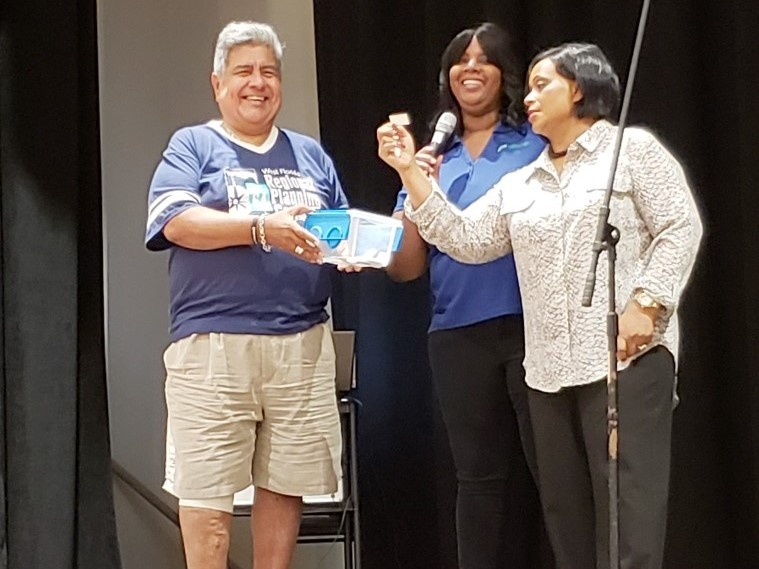 rideOn Commuter Assistance partnered with Escambia County Area Transit (ECAT) to explore bus route solutions that work for riders and address route modifications recommended in ECAT's operational analysis report. 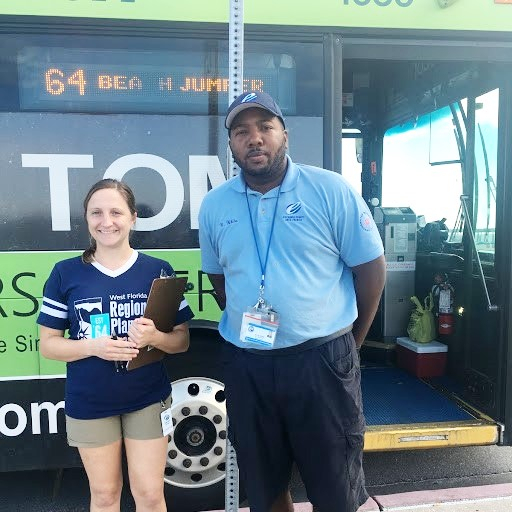 Bus rider surveys were conducted on Pensacola Beach routes 61 and 64. 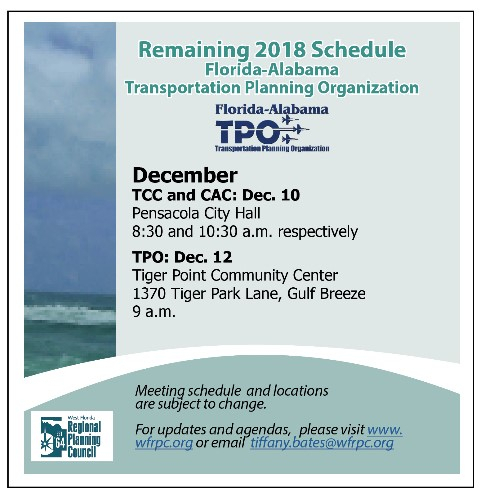 For more information on available rideOn resources for employers and community organizations, contact Caitlin Cerame or call 850-332-7976, ext. 203. 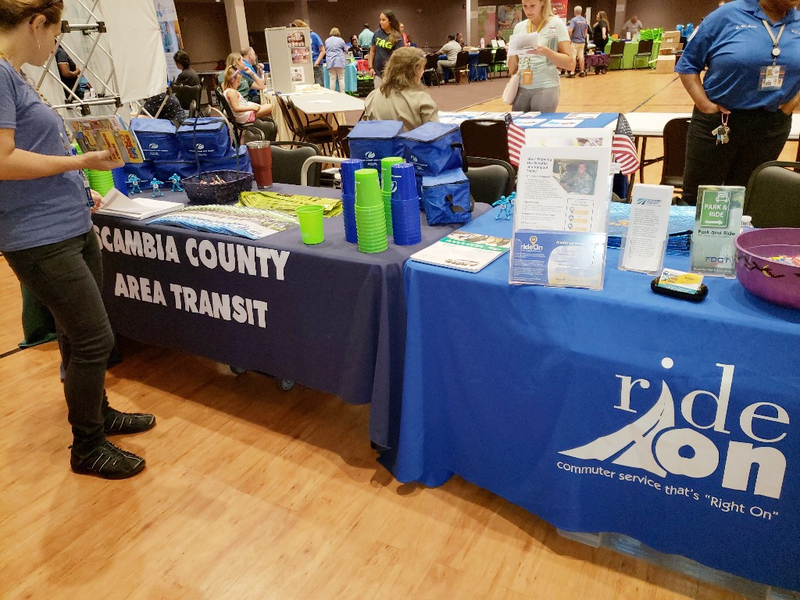 The rideOn team joined ECAT and other community organizations on Oct. 13 at the Brownsville Community Center in Pensacola for the Escambia Cares Community Resource Expo. Vendors provided information about housing services, employment opportunities, and assistance programs in Escambia County. Attendees enjoyed free music, activities, and refreshments.